Der erste Preis des EuBea - European Best Event Award geht an das "200jährige Jubiläum der Schlacht von Waterloo”, produziert von VO Communication in Kooperation mit Verhulst Events und Luc Petit Creation. Das EuBea Festival in Sevilla wartete mit Networking auf allerhöchstem Niveau auf und war für alle Beteiligten ein Quell kreativer Inspiration. Das EuBea-Festival 2016 wird in St. Petersburg stattfinden. 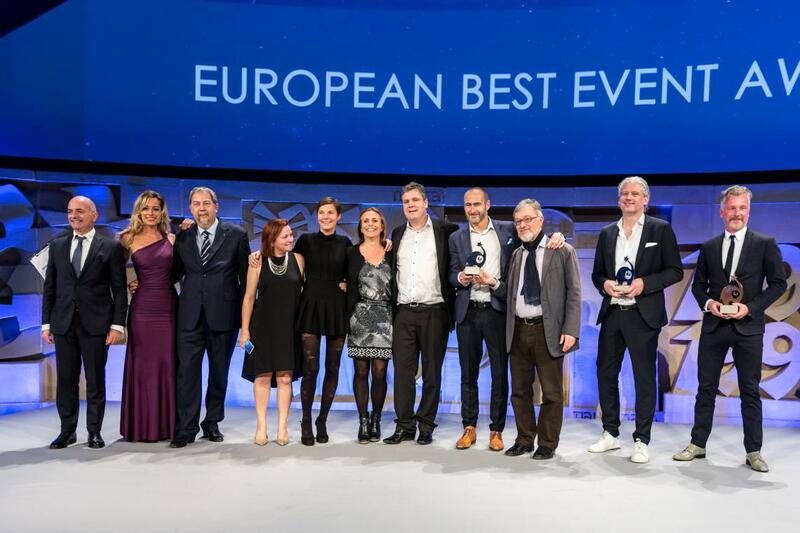 The winners of the tenth edition of EuBea - European Best Event Awards, held for the second consecutive year in Seville – have been announced. The prize, awarded within the second European Festival of Events and Live Communication, saw the participation of 290 events from 122 agencies representing 21 European countries, who competed in live presentations before a jury consisting of about 30 reputable representatives of companies and trade associations. The award for European Best Event Award 2015 went to the "Battle of Waterloo Bicentenary Commemoration" event, a spectacular and visionary re-enactment of the battle of Waterloo conceived by VO Communication in partnership with Verhulst Events and Luc Petit Création for Bataille de Waterloo 1815 asbl. The second prize went to "The Opening Ceremony of the 2014 Glasgow Commonwealth Games", created by Jack Morton Worldwide for the Games’ organising committee. The “Opening Ceremony APM Terminals Maasvlakte II, Rotterdam”, by the agency BIND for APM Terminals Maasvlakte, took the third step of the podium. The Press Jury, consisting of journalists from 14 European countries, awarded a special prize to the project "Hearing Hands" by Dinamo Istanbul, now part of Casta Diva Group, and created for Leo Burnett Istanbul and Samsung Electronics Turkey. The award was granted for the ability to combine the physicality of the event to expendable content on other media, from advertising to social engagement. A clear sign from the jury to the entire industry, in view of the transition from the logic of the event to that of live communication. The "Hearing Hands" campaign was one of the brightest protagonists of the Festival, as it also won awards for Best Event in the Low budget, Integrated and Hybrid categories, as well as special mentions for the best Creativity and Effectiveness. Among other honourable mentions, the award for Best Agency went to VO Communication, which also took Best Creative Director for the work devised by Michel Huvenne and Luc Petit. Samsung was voted Best Event Company of 2015. One of the crucial elements of projects competing this year was the ability to combine the typical spectacular factor of the event with the power to reach its audience even through digital and traditional channels, moving away from a concept of mere tactic and turning it into an intersecting strategic lever within the marketing mix. Another element held in high regard by the jury was the measurability of campaigns in quantitative terms, a key element in assessing the impact of competing initiatives in terms of business return (ROI). "The gap between an event and other forms of communication is shrinking more and more. The very definition of event is evolving, with a fluidity and complexity that brings us to talk about it today in terms of live communication, a format that transcends the classical concept of event as separate from other forms of communication", said Salvatore Sagone, president of EuBea and ADC Group. "We are very satisfied with the outcome of this tenth edition of the Festival, which began with record numbers and culminated with a two-day gathering in which the international elite of the event industry and of live communication exchanged ideas, strategies and outlooks. The success of EuBea 2015 is proof that the event industry is increasingly strategic for the global business landscape, as well as for the local economy. This is confirmed by the interest shown by institutions and associations present as sponsors and supporters of the event, from the Sevilla Congress & Convention Bureau, to the tourist boards Turismo De Sevilla, Turismo De La Provincia Andaluz, as well as the Chamber of Commerce". 3. Fiat 500X: The Power of X; Agency: krow communications; Client: Fiat - FCA Italy S.p.A.